You can learn how to make food gift baskets for Christmas all through the year. I love unique baskets and other unusual ideas which I can incorporate into the holidays. Homemade, one of a kind baskets are a favorite of mine. I have always liked doing and making things which are different and this also applies to my Christmas gifts. I learned how to make my own food gift baskets for Christmas and it gives me the opportunity to be really creative. Most of the commercially made baskets are reproduced many times. They are often stuffed with empty boxes and wasted paper, most often having an enormous price attached to them. Making them homemade gives the opportunity to pick up items and make food which doesn’t have to cost a lot but yet appear expensive. 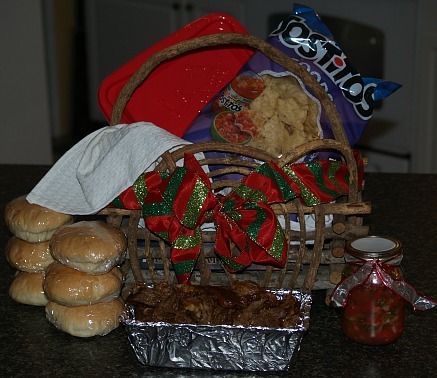 It amazes me when I see how other people have learned how to make their food gift baskets for Christmas and other homemade containers to use for gifts. One time I was at a friend’s farm and we were standing in her barn talking. All of a sudden my eye caught a glimpse of a basket like container. I immediately walked over to it to check it out. I asked my friend where she ever got something like that. My first thought was that I would love to include this in my food gift baskets for Christmas. Immediately the answer I received from my friend was “Take it please”. I couldn’t believe what I was hearing; it was so nice! Someone had made it out of branches and vines; it is so original, sturdy and nice. Evidently it had been laying in the barn for years with no use. I offered to pay for it but the offer was declined; I am so grateful. I just have to remember to give this gift to my friend so I know I will eventually get it back! I like to design food gift baskets for Christmas to fit the individual to whom I will give it to. Cooking and baking recipes which I know my friend or family member loves to eat but never seems to have them all through the year is what I look for. Another very important factor to look at is if they have health issues like diabetes, gluten intolerance etc. With all the sweets and heavy gluten products around at Christmas, it is a very special gift to give something these people can eat without making them sick. 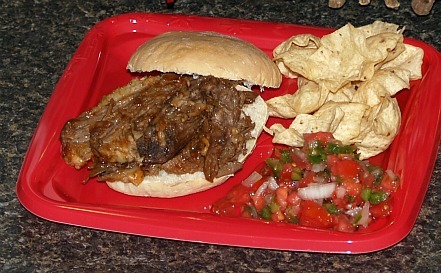 The best barbeque beef sandwiches are made by first cooking beef brisket. Start a day before you want to use the meat. Combine the onion salt, celery salt, garlic salt and black pepper. 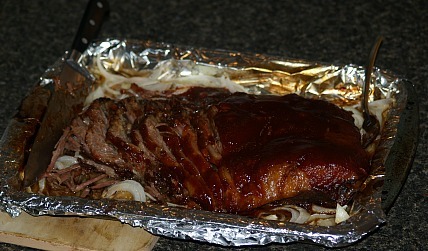 Rub seasonings all over the surfaces of the beef brisket; place in the roasting pan. Sprinkle Worcestershire sauce on brisket; Cover with foil and chill overnight. Preheat oven to 275F degrees; bake covered brisket for 5 hours. Pour barbeque sauce over the brisket and place onions around it. Bake uncovered for an additional hour. Slice thinly across the grain and serve on hamburger buns; use pan dripping as an accompaniment. Add shortening and salt to hot milk stirring until melted; cool to lukewarm. Stir cooled mixture into yeast mixture; stir in enough of the flour to make a soft dough. Turn dough out onto a lightly floured surface; knead in enough of remaining flour to make stiffer dough. Knead until dough is smooth and elastic 8 to 10 minutes. Place dough in a clean greased bowl turning to coat; cover with a clean towel. Let rise in a warm draft free place until doubled in bulk about 1 to 1 ½ hours. Punch down dough and divide into 8 equal parts; shape each into a ball. Flatten each ball with hand palms into a round 4 inch diameter round bun. Place buns on baking sheets; cover and let rise until double about 25 minutes. Preheat oven to 425F degrees; dust buns lightly with flour. Process canned tomatoes in blender. Dice the rest of the ingredients very fine; mix in with tomatoes. Refrigerate overnight to blend flavors. Here is another choice to make Mexican salsa for your food gift baskets for Christmas. It is all fresh and delicious. Combine and mix all ingredients in a glass bowl; refrigerate 1 hour before using. 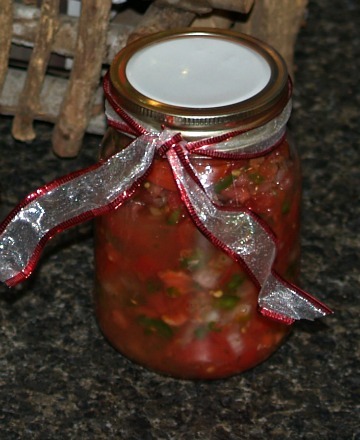 Put salsa in a clean glass jar and decorate for Christmas to give as gift.